A VID = Advancement via Individual Determination. Designed to increase schoolwide learning and performance for students. Mission is to close the achievement gap by preparing ALL students for college and career readiness. Demonstrated Learning: Students will be organized and prepared in all classes through a schoolwide P.R.I.D.E. effort called “Demonstrated Learning” using strategies that apply in all of their classes at FMS. ALL FMS students will have receive a binder, pencil pouch, divders, and corresponding organizational materials. 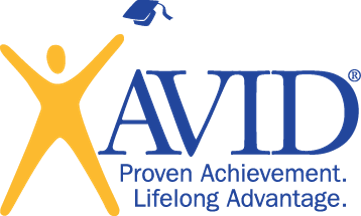 Student Engagement: Students will be engaged in their learning using AVID WICOR strategies in all content areas throughout the year.